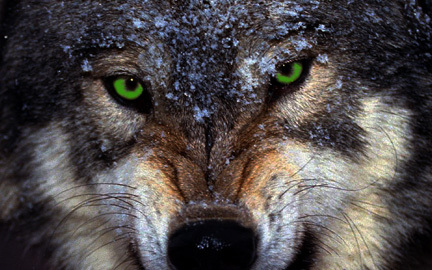 “We reached the old wolf in time to watch a fierce green fire dying in her eyes. I realized then, and have known ever since, that there was something new to me in those eyes—something known only to her and to the mountain. I was young then, and full of trigger-itch; I thought that because fewer wolves meant more deer, that no wolves would mean hunters’ paradise. But after seeing the green fire die, I sensed that neither the wolf nor the mountain agreed with such a view” (Aldo Leopold, A Sand County Almanac, 1949). As a forester in the South-West, Leopold’s job was to control predators for protecting game species. But one day after shooting a wolf he had something like a religious conversion experience: an ineffable change of heart. He started questioning policies and cherished beliefs about managing wildlife populations. He guessed that when wolves and cougars were extirpated the deer and elk populations would boom, the genetic stock would deteriorate as less fit animals were no longer weeded out, and overgrazing herds could eat out their food supply and starve. He had realized that when a keystone species is eliminated the ecosystem gets out of whack, although he didn’t live to see proof of his theory when gray wolves were reintroduced to the Yellowstone National Park. Leopold, exchanging his rifle for a pen, drafted a Land Ethic from his Wisconsin farm at the end of life. When I read the passage that, “conservation is a state of harmony between men and land,” I wondered about my own backyard. Is it as harmonious as I assumed, or had I been hardening an ecologically dissonant landscape? After a hurricane ravaged our acreage we brought in topsoil, planted trees, seeded lawns, and laid out flowerbeds. It was patient work and now, nearly a decade later, the yard looks mature and the new growth provides welcome shade from Virginia’s summer sun. A landscape designer planned the attractive setting for our home, something that neighbors and visitors could admire and I could imagine featuring in a glossy garden magazine. But in making landscape appeal the goal we paid no heed to the interests of critters who shared the land with us. Perhaps I was delusional in thinking I was acting as nature’s physician, healing the wounded land by turning it into a garden of neat lawns and cheerful flowers. I know how appearances can be deceptive, like assuming that a ruddy human face always means a healthy body. Healthy bodies don’t need a physician because they can fight off some threats and repair wounds. We have allostatic mechanisms that return stressed bodies to a stable state. Likewise in the oak-hickory forests that existed here before European colonization, there was a self-regulating biome in which the bottom of an energy pyramid fed by products of decomposition and photosynthesis provided nourishment for a rich variety of herbivorous animals which, in turn, fed carnivores and top predators. After a wildfire or storm the landscape was gradually restored by a succession of larger plants and trees, like scabs healing over a skin wound until the canopy closed over again. When Teddy Roosevelt wrote about the Grand Canyon, “You cannot improve on it. The ages have been at work on it, and man can only mar it,” he might have been thinking about the great eastern forest of America, but it was already fragmented. It had taken only a few generations to undo what eons of evolution had created. A land as bountiful as Virginia’s was never going to be left to nature. The Peninsula is now a mosaic of farms, gardens, and woodlots. It is picturesque, even romantic (Virginia is for Lovers), but no longer in harmony with nature. 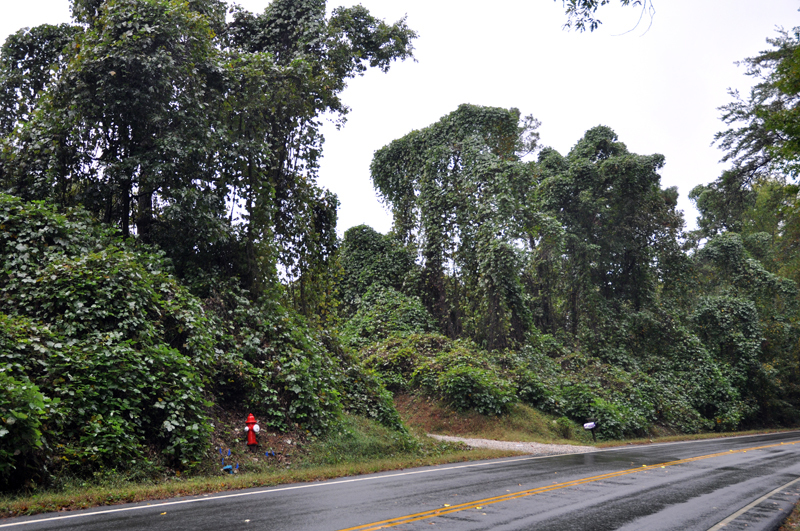 Even nature preserves that look “natural” to our eyes need help in their struggle against invasive animals, plants, and diseases introduced from Asia and Europe: bamboo marches, kudzu smothers, cankers kill, and Japanese stiltgrass blankets the forest floor. Gardeners and farmers wage incessant war on alien plants and epidemics of tent caterpillars, Japanese beetles, ticks, and cloven-hooved locusts (deer). Despite spraying lakes of herbicides and pesticides, the insurgents keep coming back. 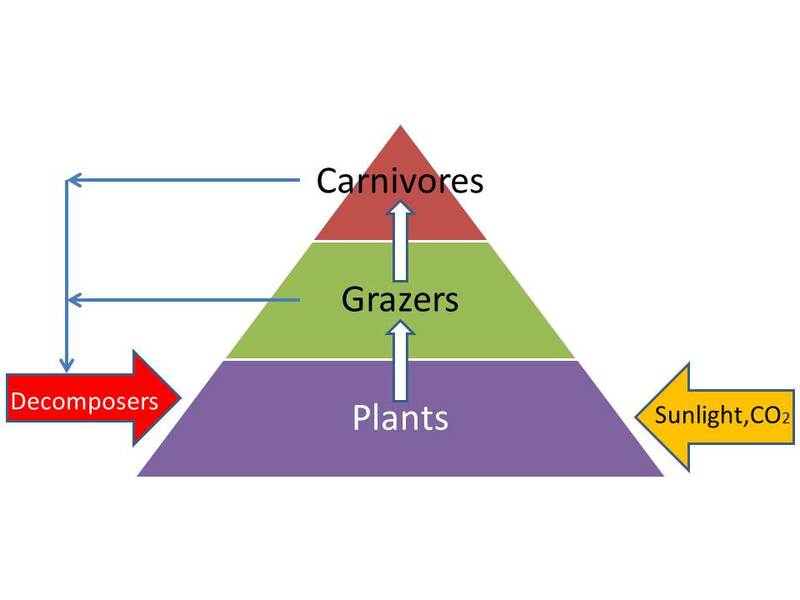 In trying to dominate nature and grow for our own needs and pleasure we are eliminating, often unintentionally, some critters at the top of the pyramid that are most beneficial as pest consumers (birds, bats, amphibians, and reptiles) or control deer herds (wolves). At the bottom of the pyramid our impact is mostly feeble or temporary (invasive and disease-bearing plants, fungi, and microbes). We would like to turn the pyramid on its head, but that is biologically impossible. Being mainly an urban species now, most of us are unaware of how much havoc human ecology has created and our continuing dependence on nature. Some species of formerly common birds have declined by over two-thirds since the 1960s; many butterflies and bumble bees that do magisterial pollination services are vanishing; forty years ago you had to raise your voice to be heard here above the din of crooning frogs, but no longer. Poisons and starvation are depleting the landscape of wonderful creatures and some of our best friends. Before I read Leopold’s book I was already tapering off my use of chemicals in the yard, applying Roundup only for spot treatment of weeds. But now I realize that my change of heart was far too tepid, and that pretty flower borders and lawns look like sterile deserts to the critters who used to live here. Most of the plants we buy are aliens that evolved in quite different environments, and without their natural herbivores they grow profusely, sometimes out-competing the natives. If these foreigners are unpalatable to caterpillars and grubs it would explain why butterflies, bugs, and creepy-crawlies are so much diminished, except for the hardiest ones which can boom when they have fewer competitors and predators. To test this hunch I checked if insects prefer our native plants. I collected bundles of leaves from many different species in our yard to count the percentage that had been nibbled. This wasn’t a perfect study, but I didn’t need more data to convince me that natives (green color) were the preferred food plants by a huge margin. Most aliens (red) were ignored by the diners. I shouldn’t have been surprised. Apart from a few insects that are not fussy about their veggies, most are particular about their food plant which they are adapted to chew and digest because they evolved in the same habitat. We have provided an inedible landscape. Animals can adapt to graze a species that is new to them, but require thousands of generations. 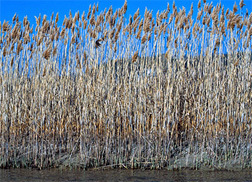 Take for instance phragmites (“phrag”), an aggressive reed that is overrunning wetlands and shorelines up and down the East Coast. In its homeland on the other side of the globe it is a food plant for 170 species of herbivores of all kinds, but since it was introduced to North America three centuries ago there are still only five species that will eat it. The mill of evolution grinds slowly. Doug Tallamy’s book helped to bring home these thoughts (Bringing Nature Home). He is an ecologist at the University of Delaware whose vision is a garden revolution for a more sustainable relationship with nature. It is too late to preserve more wilderness areas here, but there are lots of “spare” land in backyards, and 40 million acres of lawn in the US. He urges us to cast aside esthetic preferences to cultivate more native plants. This doesn’t mean turning back the clock to the original forest—which has gone forever. But we can have a healthier land, and need it as desperately as a patient fed by tubes, wires, and drips in the ICU needs organ and stem cell transplants to recover. 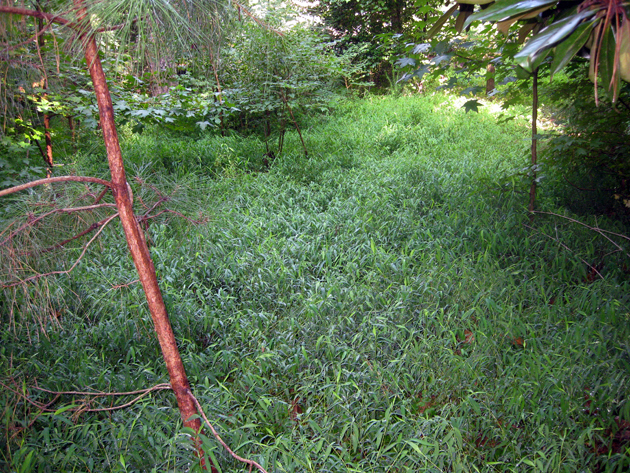 But when Tallamy explained that native plants help to restore the numbers of insects I paused. Yikes! Is he crazy? What will my family and neighbors say? It’s hard to defend bugs and creepy-crawlies, apart from butterflies and bees. It’s easy to point fingers at industries that pollute waterways and developers that scorch the ground for new shopping malls. But responsibility also rests on our shoulders, and especially gardeners and farmers as land stewards. With a pricked conscience I raised my lawnmower blades to their maximum height so that white clover flowers beloved by pollinators are not decapitated. I’m now convinced that clover is more attractive than fescue, staying green all winter, and more beneficial, providing soil nourishment by nitrogen-fixation in the roots. Clover is not a native here, but I’ve found commercial growers that supply native plants for a butterfly garden: milkweed for monarchs, spicebush for swallowtails, and violets for fritillaries. I also have a new “immigration control” policy for alien plants, and am growing native redbud, dogwood, crab apple, Rudbeckia, sneezeweed, joe pye weed, wild asters, and possumhaw. They are no less beautiful, and if their leaves are grazed more by insects I feel a green fire of satisfaction that critters will feast on them. This entry was posted in Animalia and tagged Aldo Leopold, conservation, Douglas Tallamy, Green fire, invasive species, native plant, naturalist, Virginia, wolf. Bookmark the permalink. 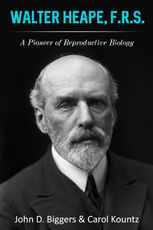 And thank you for continuing to share Leopold’s message!